Whenever it comes to electric showers in a budget, there are quite a lot of options. But the fact is that not all of them are top in quality or offers you the best features possible. Most of those electric showers offer you cheap product plus you do not get many features. But still, there are quite a lot of electric showers which manages to offer you the best in the business quality along with great services. One of such electric shower is the Triton Perea. Just in case if you are looking ahead to get the electric shower. Then you better read our Triton Perea review. 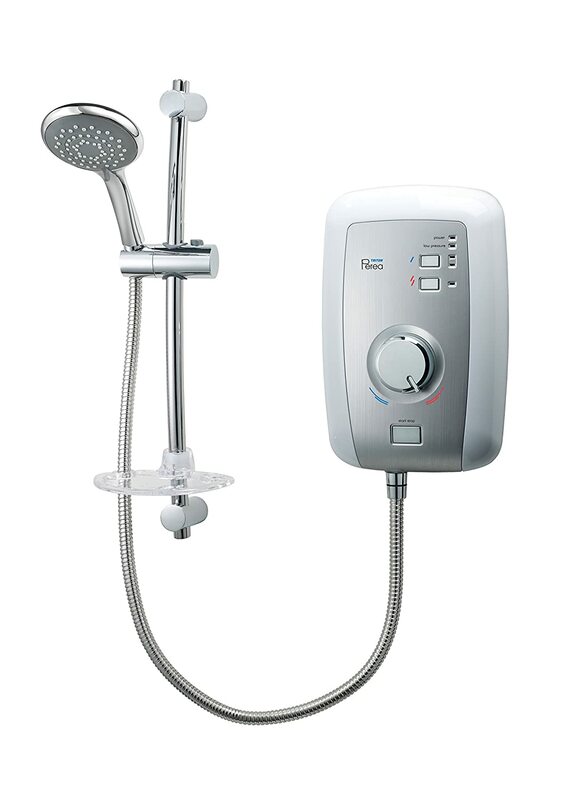 Triton Perea is one of the best electric showers available in the market. This one is not just super affordable. But at the same time, you are getting top-notch services. And this definitely makes us buy this electric shower over any other one. The electric shower comes with a slim design. It sports a white body which is brushed with steel effect fascia. Plus you get all chrome riser rail and handset. The Compact Slimline Design offers you a discreet and integrated appearance. Also using the electric as easy as you can imagine. It comes with push button power settings. It comes with three power settings which are the cold, economy and high. Also, there are push buttons for the start and stop functions. Using these buttons, you can easily switch on the electric shower and choose your preferred method. You do not have to rotate any dial to get your favorite temperature. Instead, use these three buttons to do the job. In case if you are getting sad that this does not have any rotating dial. Then hold on, this one does come with a Rotary Temperature Control Knob as well. This offers you easy grip over the temperature, and you can select your preferred temperature easily. In addition to that, you will get the ‘Power On’ Indicator and ‘Low Pressure’ Indicator. These indicators help you to understand the status of the electric shower. There is also the phased shutdown feature included in the electric shower. This means when you will turn off the shower the water will continue to flow from the shower head and flush out all the hot water. As a result, the next person who will take a shower will experience a safe experience. Plus it will prevent limescale build-up and offer the electric shower a long lasting life. Moreover, with the electric shower, you will get premium shower kit. Plus it comes with 5 spray patterns which will offer you a spa-like feel. Along with that, you will get one year of warranty. The Triton Perea is priced a little bit priced high compared to the other electric showers that the brand has launched in the market. However, the thing with the Triton Perea is that you get quite a lot of features which other Triton electric shower lacks. Plus with this electric shower, you get a luxurious shower experience. In addition to that, it is easy to install and use. Overall, the electric shower offers you a great shower experience. You can also easily control the electric shower. Just press a button, and you can turn on or off the electric shower. Furthermore, to get your perfect temperature, there are three control settings. These settings are the eco, cold and high. You even a get a rotary temperature control dial which allows you to set the water temperature to your preferred level. The rotary dial feature is one of those features that most of the electric shower lacks. But we are glad that Triton has embedded it in their The Triton Perea electric shower. Moreover, you will get the phased shutdown feature that flushes out the preheated water and makes the shower safe for the next person. Also, it helps in preventing the limescale build which helps in increasing the life of the electric shower. Also, there is a feature called “Kwik” this feature helps in cleaning your showerhead. So it can offer you service in the long run. Plus the low-pressure indicator informs you when the water pressure becomes low. So you can quickly take action. So that was all for the Perea Review. Overall this electric shower offers you a sleek design and some of the most useful features. Plus there is a one year warranty. These are some of the things which definitely makes it one of the best electric showers in the market. So go ahead and have a look at it and see if it has pleased you or not.